Nineteen years ago, in my freshman year of high school, I took my first international trip. My family didn’t have much money but I was a girl full of faith and will. My goal of traveling to Costa Rica seemed a long shot but I went for it. I sought out and closed in on any opportunity to clean, mow, or babysit for friends, family, and neighbors. Basically, if they were willing to pay, I was willing to work! Wallpaper was all the rage about this time and I even got to dabble in the installation and removal of that. Work ethic had been born and I learned a lot. For example, I’ll never EVER have wallpaper. Our family trips mostly consisted of trips around Oklahoma. My boyfriend jokes when I talk about all the places I want to go. “You would go anywhere. You would go to Hugo, Oklahoma if somebody suggested it.” Well, actually… been there, done that! In May of 1997, we loaded up to spend a few days in Hugo and to take the Hugo Heritage Railroad to Idabel for Dogwood Days. I’m sure my parents got this idea off of a weekly episode of Discover Oklahoma. Anyway, that was a long time ago and I don’t remember too much about it except for the train ride and a knock off Tommy Hilfiger shirt that I got from the festival. Because I think some of you might could use a laugh today, here I am rockin’ my new TH in Idabel. At the train station in Hugo. That was the first time I had ever been on a train except that one time my dad nearly had us headed to California while we were downtown one Saturday. I guess he thought it was local and something fun we could do. Probably a good thing he finally asked somebody where it would be going. I’m not sure my mom ever knew about that…at least not until now! Occasionally I was lucky enough to venture all the way to Texas, Arkansas or Missouri, but when I was 14 I overhead one of our youth group leaders talking about a mission trip to Costa Rica. I was a little late to the game but she said I could go as long as I met the financial deadline to secure a ticket. My mom’s permission was the only thing I needed – plus about $800, but mostly just my mom’s permission. For some reason, all my mom could hear was the money when all I needed to hear was a yes. That was my pitch – “Don’t give me any money. Just say yes. If I can’t come up with the money, I can’t go anyway.” After a long battle of practicality and reason vs. the power of will we struck a deal. I get the money, I’m going. I don’t get the money, I’m not going. The money wasn’t coming from my parents. Good enough! I signed up. Finally Traveling to Costa Rica! After a ton of hard work and an expedited passport, there I was sitting on a plane. It was my first time on a plane! I could hardly believe where I was or where I was going. Costa Rica was my first international trip and it was the beginning of a passion to see the world. We were able to stay and share meals in the homes of local church families as if we were one of their own. Their gesture of appreciation for the help we would provide gave us the most authentic experience we could ask for. That is how I learned to travel and how I continued to travel for the next 5 years. No matter how hard I worked for those trips, they were nothing short of gifts with memories that I will always hold close. There is no doubt in my mind that traveling to Costa Rica and taking multiple similar trips over those 5 years built the foundation for how I feel about travel. Travel is fun and it is exciting but it isn’t just about a destination. It’s about understanding each other. Where was your first international trip? In what ways has travel shaped your view of the world? Learn more about me and my blog here. Read about my latest trip to Rome. Share this blog post on Pinterest! How cool it is that trip shaped your future as an entrepreneur. I love that! As a kid I always lacked this but I admire the people who pull it off! Going abroad without my family in college was a huge experience for me. Learning to be independent in a foreign country was fun and so exciting. I learned more than just what they taught us in class. Those memories will last me a lifetime. Seeing your Tommy Hilfiger sweat shirt brought back memories of my childhood ;). 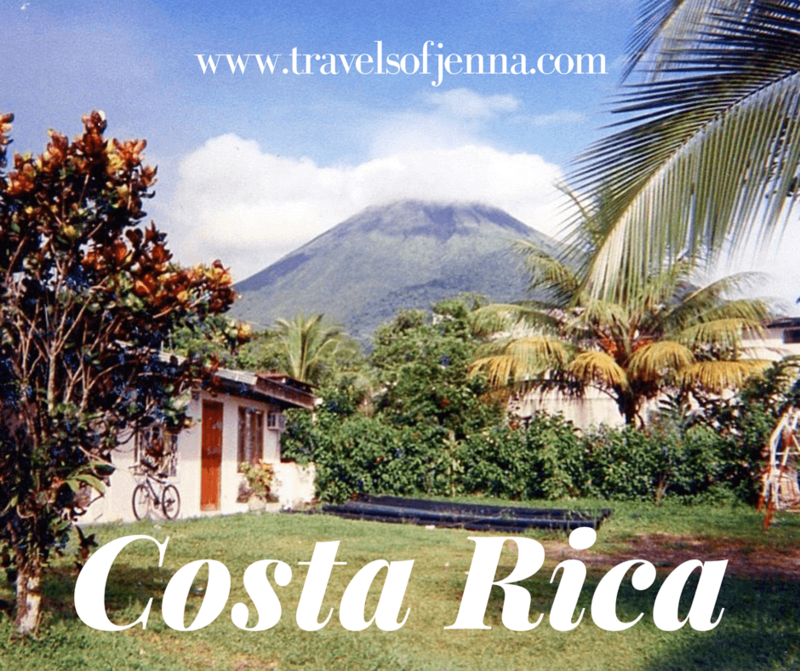 I traveled to Costa Rica some years ago…beautiful, interesting place! $800 for a trip must have seemed insurmountable, but you did it! Just another benefit of travel – you find you can do things you hardly thought were possible! ? Awesome! Would love to hear the story of how you raised the money. Love, always fun making memories! I am so happy for you that you made it to Costa Rica! Shows how the power of persistence pays off! So awesome that you made it happen! My first international trip was to Australia with a statewide cheerleading/football/volleyball group. I, too, had to come up with the money to go. We did garage sales, bake sales, sponsorships, car washes, etc. Definitely instilled in me the hard-working attitude. Just a kid on a mission. Sweet eighteen year old. I was a few years older and travelled from rural Manitoba to Europe for a year. You are right, travel is about understanding. I love Costa Rica and I love the example of work ethic! This is something I value and want my children to understand one day! That is so awesome that you made it happen! What a great experience. I have never been to Costa Rica, but I would love to go! My first truly independent trip abroad was when I studied abroad in Ireland during college. I went with my best friend and we traveled Europe for 4 months while taking classes. It was so amazing and I learned so much about the world and myself. I have wanted to go to Costa Rica ever since my niece went. She had so much fun there. So great that even at a young age you had a desire to travel! Costa Rica looks beautiful! Thanks for sharing. There is nothing like traveling abroad. The experiences and life lessons are so valuable. You sound like me. I didn’t have money to travel so I got a job abroad instead. Everyone said I was crazy but it was the best experience ever. I traveled to so many places I wouldn’t have been able to otherwise.